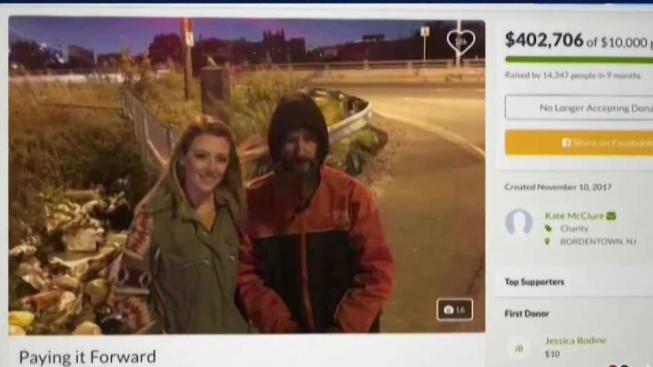 A homeless veteran who gave his last $20 to a young woman in Philadelphia will get all of the money that was raised for him in a GoFundMe account, the website says. Johnny Bobbitt, who the money was raised for, says Katelyn McClure and her boyfriend Mark D'Amico spent the money raised for him. So how can you protect yourself from funds being misused? Johnny Bobbitt, Jr., the homeless veteran at the center of an online fundraising controversy turned criminal investigation, will get the full $400,000 donors gave to him. GoFundMe, the crowdsourced fundraising website, and Bobbitt's attorney, Chris Fallon of Cozen O'Connor, made the announcement Thursday evening. "Johnny will be made whole and we're committing that he'll get the balance of the funds that he has not yet received or benefited from. GoFundMe's goal has always been to ensure Johnny gets support he deserves," GoFundMe spokesman Bobby Whitmore said in a statement. The New Jersey couple — Mark D'Amico and Katelyn McClure — who started the campaign to help Bobbitt are now under investigation for allegedly misusing the funds. McClure and D'Amico started the GoFundMe campaign after he used his last $20 to buy gas for McClure, whose car ran out of gas in Philadelphia in November. More than 14,000 people donated to the campaign that garnered international attention. Law enforcement executed a search warrant at the couple's Burlington County home early Thursday, carting away boxes of evidence and a new BMW. Fallon said he only received $75,000 of the money, which includes the value of a camper and a 1999 Ford Ranger. That came a day after a New Jersey judge demanded they make sworn statements about the status of the money and provide documentation. Fallon said GoFundMe will conduct an audit to determine how much money Bobbitt is owed and then provide it to him with the help of the legal team. The couple did not answer questions as they left their Florence Township, New Jersey, home Thursday. Their attorney, Ernest Badway, also declined comment. The criminal investigation remains active, but no charges have been filed.